The NT Land Rights Act gave Aboriginal people a say over land development through informed consent but governments are constantly chipping away on "the Mt Everest of land rights". 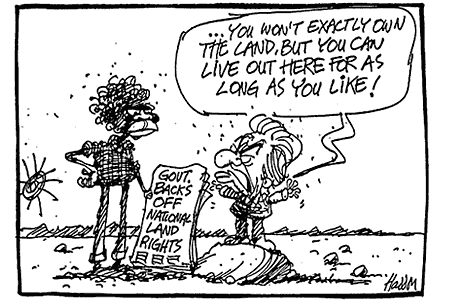 The NT Land Rights Act(Land Rights Bill) was introduced on 16 October 1975 and became law in 1976. Under the act, more than 50% of the Northern Territory was returned to traditional Aboriginal owners in the following 30 years . The NT Land Rights Act gives Aboriginal people a strong say over what should happen on their land, through the principle of informed consent. It allows traditional owners to keep their culture strong and to negotiate constructively with governments and developers over mining and infrastructure projects. The Act was a consequence of the Wave Hill walk-off in which 200 Aboriginal people had walked off a cattle station. Initially fighting for equal wages their protest soon turned to the core issue, land rights. Unfortunately, many non-Aboriginal people, including governments (past and present) and resource industries, perceive the Act as a threat to their economic, social and political influence in the Northern Territory , a fear that let governments make various amendments (see below). The Act helped establish Aboriginal Land Councils. While the NT Land Rights Act gave many Aboriginal people their traditional lands back, those whose country was on a pastoral lease, were left out. Unless the traditional owners had bought the pastoral lease, it couldn’t be claimed as Aboriginal land under the Land Rights Act . As pastoral leases are very expensive and difficult to buy very few people got their land back in this way. Otherwise Aboriginal people could only claim Crown land. On pastoral leases, the only Crown lands were the stock routes, so during the 1980s, many Aboriginal people put land claims on stock routes. In 1989 the government made a unilateral "Memorandum of Agreement" that it would hand back some areas of stock routes and reserves, amend the Land Rights Act to stop any more stock route land claims, and make a law for people to be able to apply for Community Living Areas (CLAs) on station country. Community Living Areas are small Aboriginal living areas excised from pastoral leases to allow Aboriginal communities to keep their links with their traditional country. The law doesn’t provide an easy way to secure land for Aboriginal people and puts a lot of restrictions on how the land can be used. However, community living area title could not be taken back by the government, it enabled the exclusion of some mining and exploration, and could not be sold . Governments in the past have provided housing and other facilities for the CLA communities. Northern Territory intervention legislation allows the government to significantly regulate CLAs. Without CLAs many Aboriginal people would be landless on their own country and have to move to towns. CLAs are vital to the future well-being of the Aboriginal people. Amendments to the Act always sought to increase access to Aboriginal land, change tenure, remove permits, weaken the veto power, reduce the roles of Aboriginal Land Councils and increase the power of the bureaucracy and the minister. Following the Gray review in 2006 the Act was amended significantly to the worse of Aboriginal people. It allows an unspecified "government entity" to control townships for 99 years and sublease blocks to whomever it wants. Aboriginal people are no longer in control, and they lost their right to negotiate benefits from those who seek to use their land (usually the resources industry). To cap it all, the costs for implementing this policy will be covered by the Aboriginal Benefits Account which was established for the benefit of Aboriginal peoples and funded by mining activities on their land . Media described 99-year town leases as a "threat like never before" with the potential to "turn traditional ownership upside down" . They put the government back into ownership and control of traditional Aboriginal land like it was before the Land Rights Act was passed. The big question is: What happens in 99 years? Will the government of that day decide to return ownership to Aboriginal people? The Respect and Listen website has compiled a timeline of events concerning the Aboriginal Land Rights (NT) Act. The Independent Australia speculated that the government created 99-year leases "to avoid having to compensate Aboriginal people on just terms under the Constitution for taking control of their traditional lands" with the objective of "permanent alienation of traditional land from Land Trusts" . Using source  as a starting point, research what the true motivation of the government could be. Imagine you are the government. What would you say to your fellow politicians, what to the public and what to Aboriginal people? Try to find evidence for your assumptions.